Making College More Affordable, One Text At A Time : NPR Ed The right text or email message can help students get enrolled, find the right payment plan and remind them to pay, White House research shows. What's the tiniest change you can think of to create the biggest improvement in someone's well-being? That's the question at the heart of the first annual report by the new Social and Behavioral Sciences Team inside the White House. This group of scientists has found that simple, small tweaks to existing official messaging can create huge effects on everything from savings to sustainability to fraud. Governments around the world are increasingly getting interested in how insights from psychology can make policy more effective. 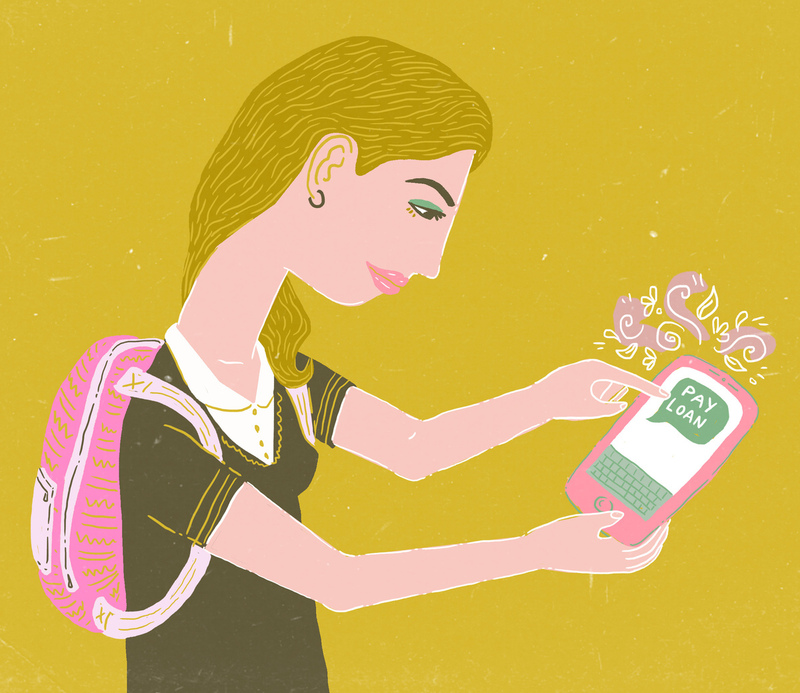 As an NPR Ed intern last year, I wrote about a proposal to use text messages to nudge students to complete the Free Application for Federal Student Aid. Now I work for the U.K.'s Behavioural Sciences Team, a firm spun off from the government to apply behavioral insights to policy problems. One area in particular where the U.S. team has found success is improving college access and affordability. The report gives three examples where low-cost text messages and emails got more kids enrolled in college and helped borrowers better manage their student loans. The first example dealt with the problem of high schoolers who've been accepted to college, but don't show up in the fall — a well-documented phenomenon known as "summer melt." To tackle this, the researchers placed 4,882 students into different groups. One group of students received personalized text messages with friendly reminders and simple instructions to finish tasks, like filling out necessary forms, over the summer. The control group got none. When the researchers followed up with the participants in the fall, they found that college enrollment among low-income students in the text-message group had jumped by 8.6 percent compared with the control group. Previous research in the U.K. (by the company I now work for), confirms the effectiveness of sending text messages to students. There the researchers found that sending simple texts reduced the proportion of students who dropped out of adult education programs by 36 percent. In the second example, a small change to an email header kept borrowers from falling behind on their student loans. By partnering with the Office of Federal Student Aid, the researchers tested variations of the subject line of an email sent to 55,000 different borrowers. After some pre-testing, the researchers settled on, "You missed a payment on your federal student loan." Just one week after that email was sent, the fraction of borrowers who made a payment grew by 29.6 percent compared with a control group who received no email. When a borrower misses a monthly payment or two, it could just be an oversight. When it happens regularly, the borrower may benefit from an alternative repayment plan — for example, one that's tied to the borrower's income rather than a fixed amount. But with all the different repayment options available, borrowers might overlook the one they're best suited to. To increase the awareness of alternative, income-driven repayment plans, researchers again worked with the Office of Federal Student Aid. This time they targeted more than 840,000 borrowers who were 90-180 days behind on their loans. The researchers tested variations of an email that included information about other repayment options and how to apply. The most effective email produced a four-fold increase in the number of applications for income-driven repayment compared to a control group. The change happened in just 20 days. What's stunning about these findings isn't that sending reminders works. That's obvious. But it is stunning how well it works considering how cheap and easy it is. To get results of this size government has traditionally had to spend gargantuan sums of money. But as this report shows, a few cheap text messages or free tweaks to existing emails can make big differences. Owen Phillips is a former NPR Ed intern who is now with the Behavioural Insights Team.